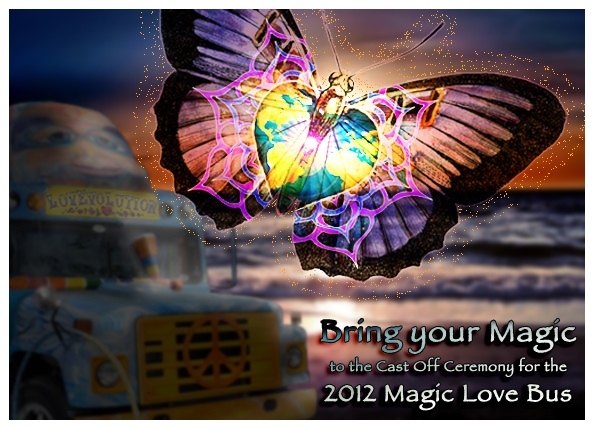 The Magic Love Bus and crew are casting off from San Francisco on a three month cross country journey to spread love and light. Come join us on the bus and on the beach for a fire drum circle, dancing and ceremony. Bring healthy organic food, musical instruments and your best magical intentions. RSVP: Feel free to RSVP on FaceBook. View photo highlights from our recent “Blast Off Party“. Our Mission is to co-create, unity, peace and understanding by bringing people of all races, beliefs and economic status together on the Bus and online. As we cross America, we intend to share food, drumming, campfires, alternative movies, discussions, dancing, music and love and light. The bus will literally be a vehicle for heart-based transformation and a platform for free expression. Together we can consciously evolve and co-create a just and sustainable world.